Dustin's practice focuses on civil litigation, including construction and related contract disputes, premises liability, negligence, and general discovery matters. Dustin has experience drafting discovery requests and responses, pleadings, motions, and trial and appellate briefs. Dustin received Bachelor of Arts degrees in both English and Music from Southwestern University in 2012. 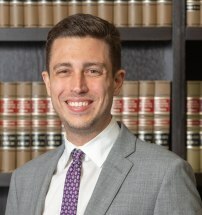 Dustin attended law school at The University of Texas School of Law, where he was a staff editor of the Texas Review of Law and Politics and interned for the State Office of Administrative Hearings. In law school, Dustin earned top grades in bankruptcy and oil and gas, as well as serving as assistant to his oil and gas professor. Dustin is a native of Fort Worth, Texas, where much of his family still lives. Outside of work, Dustin enjoys playing and listening to music, cooking, and periodic road trips.